This beautiful Lemon Basil Poppy Seed Dressing is bursting with vibrant flavor. It’s fabulous drizzled over salads, entrees and veggies! After the first taste, I knew this Lemon Basil Poppy Seed Dressing would become my go-to dressing for the upcoming season (and beyond). I love that it’s vibrantly delicious, so easy to make, comes together in minutes and has a short and super simple ingredient list. I think you’re going to flip over it too! This Lemon Basil Poppy Seed Dressing is wonderful on spinach, arugula, butter lettuce, Romaine, spring greens – really just about any kind of salad greens. A drizzle of it over chicken, salmon or pork tenderloin transforms an ordinary meal into a gourmet experience! I’ve also used it as a delicious dipping sauce for shrimp. It’s one of those super versatile, universally popular recipes you’ll love having in your recipe collection. Make this dressing all year long! Yes, this is definitely a recipe to make in the summer, when the garden is running wild with basil. But it’s also a fabulous fresh taste during the cold-weather months when the taste of fresh herbs is a welcome respite. I like to use a half cup of packed fresh basil when basil is plentiful but have made the dressing with as little as a quarter cup which is approximately the amount in the little plastic cartons sold in most grocery store produce sections. Like I said earlier, the ingredient list is simple: fresh basil, olive oil, lemon juice, honey, and salt. Just throw everything in a blender or food processor and give it a whirl. Voila – a magical transformation! Transfer the beautiful, emerald-hued dressing to a jar or serving container and stir in a few spoonfuls of poppy seeds. The poppy seeds add a pretty touch to the dressing, but they’re optional; as the flavor will be the same with or without them. I’ve been making a wonderful Strawberry Spinach Salad recently and using this Lemon Basil Poppy Seed Dressing to dress it. This gorgeous salad would be perfect for Mother’s Day, a graduation party, a wedding or baby shower – actually any kind of get together! Recipe coming up (spoiler alert: expect lots of oohs and aahs)! The recipe calls for 1/4 to 1/2 cup fresh basil. By all means, use the full 1/2 cup when basil is in season and readily available. During the colder weather months when fresh basil is expensive 1/4 cup will still make a delicious dressing. Be sure to pack your basil tightly into the measuring cup. There’s a big difference in amount between loosely and tightly packed herb leaves. Try this dressing as a drizzling sauce over any grilled entreés, chicken, fish, pork, steak… it’s the essence of summer in a sauce! You can use a blender or food processor for this Lemon Basil Poppy Seed Dressing. Using a food processor will result in a smoother dressing. I use my KitchenAid Proline Blender. I’ve been using mine for several years now for sauces, soups, smoothies, nut butters, dressings and tons of other things. It’s a beautiful machine and blends similar to a Vitamix, but it’s sturdier and easier to clean. If you’re looking for a wedding, birthday, Mother’s Day, graduation gift for someone who loves to cook and/or loves to eat healthy, this would be a wonderful choice. Put a batch of this Lemon Basil Poppy Seed Dressing in a pretty jar or cruet and give it to a friend, neighbor or co-worker as a gift. Be sure to share all the delicious ways to use it! 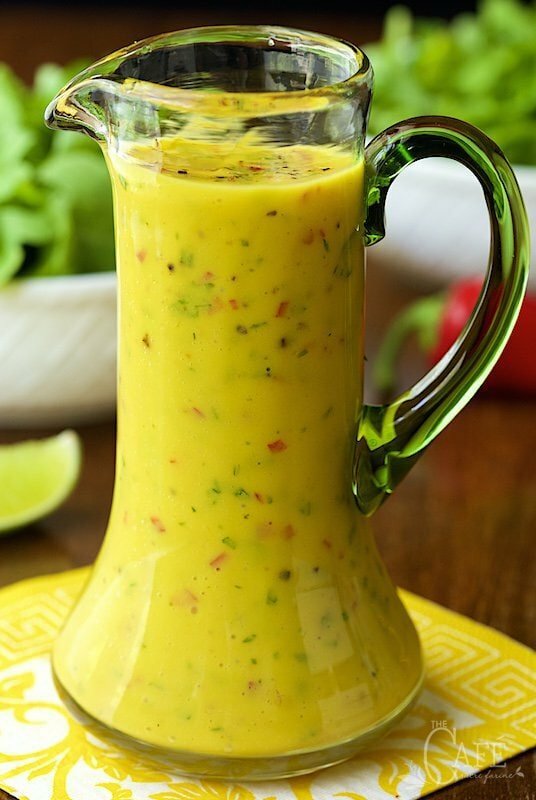 If you enjoy this Lemon Basil Poppy Seed Dressing, you will probably also love our Sweet and Spicy Mango Dressing. It’s one of the most popular salad dressings on the blog! This beautiful Lemon Basil Poppy Seed Dressing is bursting with vibrant flavor. It's fabulous drizzled over salads, entrees and veggies! Combine all ingredients except the poppy seeds in a blender or food processor and blend until fairly smooth. Transfer to a jar with a tight-fitting lid or a serving container. Store in the refrigerator. Will keep well for 3-5 days. I’ve been searching for a salad dressing with no onions or garlic and it’s like trying to find a needle in a haystack. Honey is a no-no right now for the Mr but as soon as he can have I’m making this. You are the salad dressing queen! And what a perfect way to crown a salad! Such a perfect dressing for spring salads! I’ ve always been envious of your beautiful basil crop! Hope I have plenty this year for a change—because I’ll want lots and lots of this salad dressing! You’re welcome, I think you’re going to love it! What a beautiful color! Just like spring, whenever it decides to arrive here 🙂 I love strawberry salads and can’t wait to see your next post too, Chris! I can’t wait to try this Chris! I’m always looking for new homemade dressings. I love making my own and customizing to my liking.This one is definitely one that I would love! Salads would taste particularly fresh and yummy with this beautiful green dressing! Are you able to provide the recipe for the strawberry spinach salad please, it looks delicous. Hi Jodie-Anne, that recipe is coming up! I wanted to share the dressing first as it will be wonderful with so many other things. You did it again Chris! This is absolutely gorgeous dressing. I cannot wait to give it a try this summer when my basil is in. Bravo! I’m a big fan of basil, and I tried a great basil dressing last week. The addition of the lemon and poppy seed in this one sounds incredible! Chris, my husband is on a very low salt diet. Do you think if I omit the salt it will still be yummy? Hi Snow, I think it will be just fine without the salt. Dressing is one of the easiest homemade foods. You make it once, and have it for a week or so. I don’t know why so many people still buy the bottles, just look at all those strange ingredients! This one is beautiful! I adore poppy seeds in any form, and this dressing looks incredible, Chris ~ it’s making my mouth water!